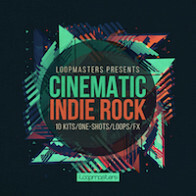 Loopmasters deliver another blistering collection of royalty-free Indie samples arranged into 10 inspiring song kits featuring Drums, Bass, Guitars, Keys and Synths - combined for a score of epic proportions – for anything from a film to a podcast! 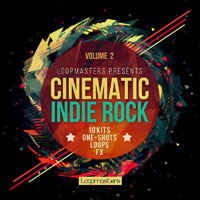 Cinematic Indie Rock 2 follows the ethos of Volume 1, with more mind-expanding shoegaze Rock with real instruments including lucid guitar riffs, punchy drums, and incisive bass combined with beaming synths for an emotive film soundtrack. Inspired by great bands such as Massive Attack, UNKLE, Enigma, Ride, The Verve, Spiritualised, Radiohead and Brian Jonestown Massacre - Cinematic Indie Rock 2 has it all! The collection is divided up into 10 construction kit folders with individual loops divided into Intro, Verse, Chorus and Leads sections for each individual instrument - clearly labelled with key and tempo allowing for easy drag and drop arrangements. Also included are 30 bonus drum fills, 240 one shot samples (Including Drums, Bass, Music and Guitar FX), 150 sampler patches and 324 rex2 files that can be used alongside the main content. In detail expect to find 1.46Gb of content with 564 individual 24-Bit files. 324 Loops are included with 30 Drum Fills, 3 Cymbal Loops, 36 Piano Loops, 49 Bass Loops, 61 Drum Loops, 21 Lead Music Loops, 63 Guitar Loops, 12 Key Loops, 26 Pad Loops, 7 Tambourine Loops, 2 Choir Loops ,4 Orchestra Loops, 4 Percussion Loops and 1 Harmony Loop. 240 One hit samples are included with 21 Bass Hits, 30 Hats, 31 Kicks, 30 Snares, 13 Percussions, 63 Guitar FX and 52 Music hits. 324 Rex2 loops, 10 Kong Drum Kits and 150 Sampler patches complete the set with presets for NNXT, Sfz, Kontakt, Halion and Exs24. 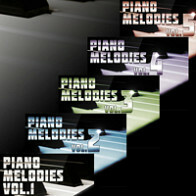 The collection is also available in Apple Loops, Ableton Live and Reason Refill formats. 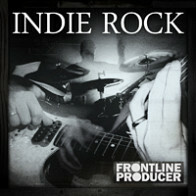 The Following End User License Agreement is included with Cinematic Indie Rock Vol.2. This License is only valid for the individual who has purchased an unopened, new and lawfully made copy of Cinematic Indie Rock Vol.2 from a dealer or distributor authorized by Big Fish Audio.